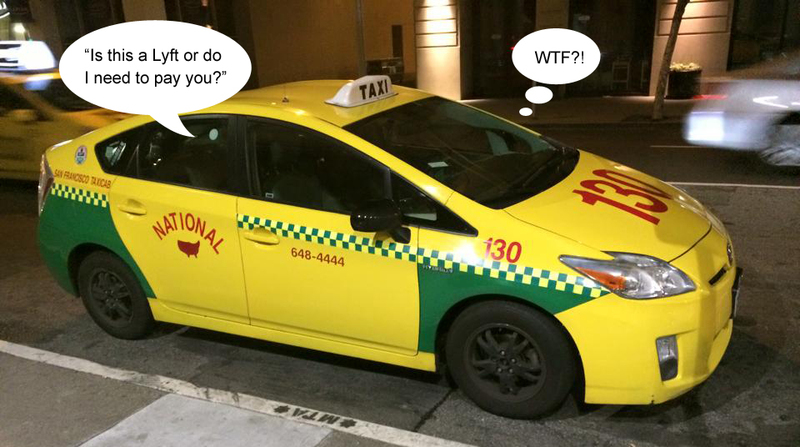 “Is This a Lyft or Do I Need to Pay You?” | I Drive S.F. It’s Saturday night. I’m cruising through Hayes Valley, keeping a watchful eye for street hails outside the Jazz Center. On Franklin, a hand goes up, though somewhat feebly. I pull over anyway. A young guy approaches my window. I head up and over the hills, fighting to catch the timed lights. As I descend into the Marina, I get in the right lane to bypass Lombard traffic. Take a left at Bay. Past Fort Mason to Laguna. Pull into the Safeway parking lot and deposit the guy at the front door like a rock star. He thanks me and gets out of the cab. “Hey! Don’t forget to pay me!” I shout. I laugh along good-naturedly. This happens all the time. Even though I’m driving a bright yellow cab with green checkers on the side. Even though there is a top light that boldly states “TAXI.” Even though numbers and insignias are painted on the doors. Even though the windows have credit card stickers and permits. Even though “SAN FRANCISCO TAXICAB” is written on the side and trunk. And even though there is a taximeter on the dash, a tablet on the headrest of the passenger seat and plaques on the inside of the doors, I go through this farce multiple times a night. “Fare-weather” passengers are a crapshoot. There are those who seem unsure how to behave in a taxi. Like this guy. 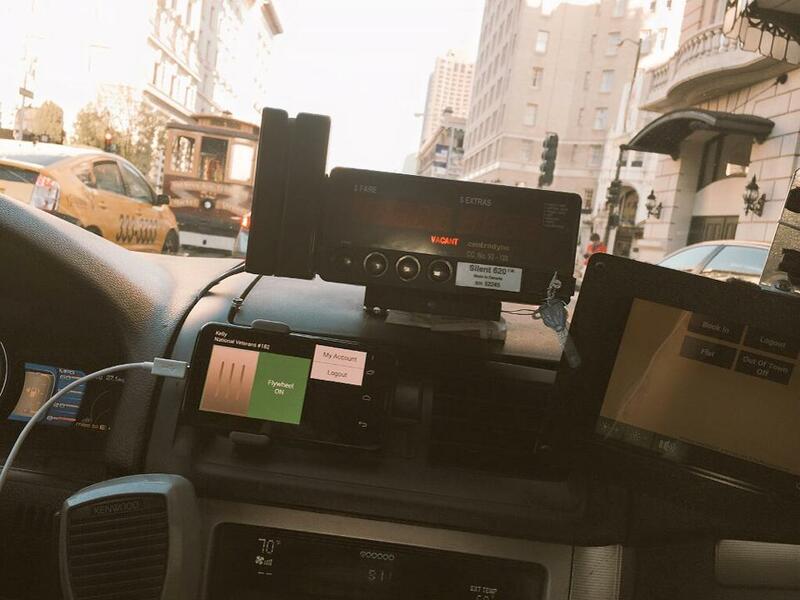 While others tell me straight up Uber is surging 4.6x and that’s the only reason they’re slumming it in a cab. Some just act like they’re in a rideshare and I have PTSD flashbacks to the ten months I drove for Uber and Lyft before switching to taxi. As I run the guy’s card through the Square on my iPhone and hand it back, he apologizes again. “Maybe you should consider driving for Uber then.” He laughs. Whatever. It’s getting late. I’m on my fourth 12-hour shift in a row. And now I’m in the Marina. During surge. Unless I bug out, I’ll end up on Union, getting flagged by seven bros who want to ride in my cab all at once (“we’ll tip you”) or a pack of girls heading to the Mission, commandeering my stereo and screaming at each other the whole way down Gough. As I pull out of the parking lot and head down Laguna to Chestnut, I groan and join the party. This entry was posted in Cab Driving, San Francisco Under Siege, Taxi Life, Taxi Under Siege and tagged clueless lyft users, clueless uber users, i drive SF, lyft, san francisco, san francisco translpants, sf translplants, street flags, street hails, taxi, taxi driver confessions, taxi drivers, Taxi Life, taxi realities, tech crowd, the new normal, uber on April 1, 2015 by piltdownlad.